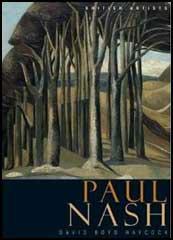 Paul Nash, the elder son of William Nash and his first wife, Caroline Jackson, was born in London on 11th May, 1889. His father was a successful lawyer who became the Recorder of Abingdon. According to Ronald Blythe: "In 1901 the family returned to its native Buckinghamshire, where the garden of Wood Lane House at Iver Heath, and the countryside of the Chiltern hills, with its sculptural beeches and chalky contours, were early influences on the development of the three children. Their lives were overshadowed by their mother's mental illness and Nash himself was greatly helped by his nurse who, with some elderly neighbours, introduced him to the universe of plants." Nash was educated at St. Paul's School and the Slade School of Art, where he met Stanley Spencer, Mark Gertler, C. R. W. Nevinson, Edward Wadsworth, Dora Carrington, William Roberts and Claughton Pellew. Unlike some of his contemporaries at the Slade School, Nash remained untouched by the two post-impressionist exhibitions organized by Roger Fry in 1910 and 1912. Instead, he was influenced by the work of William Blake. He also became a close friend of Gordon Bottomley, who took a keen interest in his career. Nash had his first one-man show, of ink and wash drawings, at the Carfax Gallery in 1912. The following year he shared an exhibition at the Dorien Leigh Gallery with his brother, John Nash. The art critic, Ronald Blythe, has argued: "Due to the enthusiasm of Michael Sadler and William Rothenstein, the exhibition, though modestly hung on the walls of a lampshade shop and announced by a home-made poster, was a success." Myfanwy Piper, has added: "Nash had a noteworthy sense of order and of the niceties of presentation; his pictures were beautifully framed, drawings mounted, his studio precisely and decoratively tidy, and oddments which he collected were worked up into compositions." Paul Nash was strongly attracted to Dora Carrington: He later recalled: "Carrington... was the dominating personality, and when she cut her thick gold hair into a heavy golden bell, this, her fine blue eyes, her turned-in toes and other rather quaint but attractive attributes, combined to make her a conspicuous and popular figure... I had noticed her long before this was achieved, when as a bored sufferer in the Antique Class my attention had been suddenly fixed by the sight of this amusing person with such very blue eyes and such incredibly thick pigtails of red-gold hair. I got an introduction to her and eventually won her regard by lending her my braces for a fancy-dress party. We were on the top of a bus and she wanted them then and there." 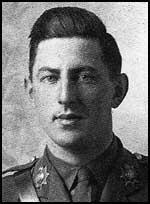 On the outbreak Nash considered the possibility of joining the British Army. He told a friend: "I am not keen to rush off and be a soldier. The whole damnable war is too horrible of course and I am all against killing anybody, speaking off hand, but beside all that I believe both Jack and I might be more useful as ambulance and red cross men and to that end we are training. There may be emergencies later and I mean to get some drilling locally and learn to fire a gun but I don't see the necessity for a gentleminded creature like myself to be rushed into some stuffy brutal barracks to spend the next few months practically doing nothing but swagger about disguised as a soldier in case the Germans poor misguided fellows - should land." Nash enlisted in the Artists' Rifles. He told Gordon Bottomley: "I have joined the Artists' London Regiment of Territorials the old Corps which started with Rossetti, Leighton and Millais as members in 1860. Every man must do his bit in this horrible business so I have given up painting. There are many nice creatures in my company and I enjoy the burst of exercise - marching, drilling all day in the open air about the pleasant parts of Regents Park and Hampstead Heath." In March 1917 he was sent to the Western Front. Nash, who took part in the offensive at Ypres, had reached the rank of lieutenant in the Hampshire Regiment by 1916. 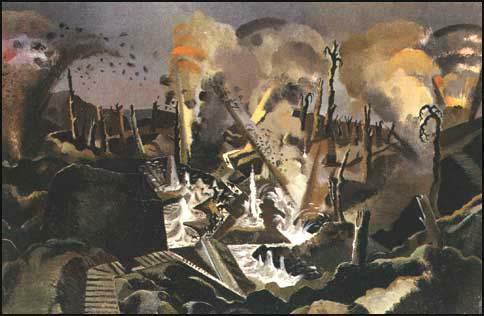 Whenever possible, Nash made sketches of life in the trenches. In May, 1917 he was invalided home after a non-military accident. While recuperating in London, Nash worked from his sketches to produce a series of war paintings. This work was well-received when exhibited later that year. As a result of this exhibition, Charles Masterman, head of the government's War Propaganda Bureau (WPB), and the advice of Edward Marsh and William Rothenstein, it was decided to recruit Nash as a war artist. In November 1917 in the immediate aftermath of the battle of Passchendaele Nash returned to France. Nash's work during the war included The Menin Road, The Ypres Salient at Night, The Mule Track, A Howitzer Firing, Ruined Country and Spring in the Trenches. Nash was unhappy with his work as a member of War Propaganda Bureau. He wrote at the time: "I am no longer an artist. I am a messenger who will bring back word from the men who are fighting to those who want the war to go on for ever. Feeble, inarticulate will be my message, but it will have a bitter truth and may it burn their lousy souls." However, as Myfanwy Piper has pointed out: "The drawings he made then, of shorn trees in ruined and flooded landscapes, were the works that made Nash's reputation. They were shown at the Leicester Galleries in 1918 together with his first efforts at oil painting, in which he was self-taught and quickly successful, though his drawings made in the field had more immediate public impact. From April of that year until early in 1919 Nash was engaged on paintings commissioned by the department of information for the newly established Imperial War Museum.... His poetic imagination, instead of being crushed by the terrible circumstances of war, had expanded to produce terrible images - terrible because of their combination of detached, almost abstract, appreciation and their truth to appearance." In 1919 Nash moved to Dymchurch in Kent, beginning his well-known series of pictures of the sea, the breakwaters, and the long wall that prevents the sea from flooding Romney Marsh. This included Winter Sea and Dymchurch Steps. 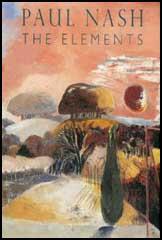 Nash also painted the landscapes of the Chiltern Hills. In 1924 and 1928 he had successful exhibitions at the Leicester Galleries. Despite this popular acclaim in 1929 his work became more abstract. In 1933 Nash founded Unit One, the group of experimental painters, sculptors, and architects which included Herbert Read, Edward Wadsworth, Henry Moore, Barbara Hepworth, Edward Burra, Ben Nicholson and Wells Coates. Nash also contributed to the Architectural Review and Country Life and wrote the Shell Guide to Dorset (1936). During the Second World War Nash was employed by the Ministry of Information and the Air Ministry and paintings produced by him during this period include the Battle of Britain and Totes Meer. His biographer, Myfanwy Piper, has argued: "This war disturbed Nash but did not change his art as the last one had. His style and his habits were formed, and in the new war he treated his new subjects as he had treated those he had been thinking about for so long. His late paintings, both oils and watercolours, are alternately brilliant and sombre in colour with the light of setting suns and rising moons spreading over wooded and hilly landscapes." Paul Nash died at 35 Boscombe Spa Road, Bournemouth, on 11th July 1946. I am not keen to rush off and be a soldier. The whole damnable war is too horrible of course and I am all against killing anybody, speaking off hand, but beside all that I believe both Jack and I might be more useful as ambulance and red cross men and to that end we are training. There may be emergencies later and I mean to get some drilling locally and learn to fire a gun but I don't see the necessity for a gentleminded creature like myself to be rushed into some stuffy brutal barracks to spend the next few months practically doing nothing but swagger about disguised as a soldier in case the Germans poor misguided fellows - should land. I have joined the Artists' London Regiment of Territorials the old Corps which started with Rossetti, Leighton and Millais as members in 1860. Every man must do his bit in this horrible business so I have given up painting. There are many nice creatures in my company and I enjoy the burst of exercise - marching, drilling all day in the open air about the pleasant parts of Regents Park and Hampstead Heath. In the midst of the monstrous event stands Man; the thousands and the hundreds of thousands, the combatants and the non-combatants; who all have one wish and one goal; to cast aside the war; to render its effect invisible so far as they can be understood; to let a well-earned Peace grow its grass over the victims and to carry on as before.